At the time it was just the two of us that moved into the home. In 2018 we were excited to welcome a baby girl to our family and we knew then that we needed to renovate. As well as the requirement to build an extra bedroom, bathroom and a more livable layout, our dream was to make it modern inside while keeping some of the original character of the home. Where did you find your inspiration for renovating your semi? Most of my inspiration came from Pinterest. I made boards for each rooms and started pinning away. I was then able to look back and see trends in what I liked. Did you & hubby agree or did you need to compromise? For the most part my husband and I agreed. The house is fairly small and we wanted to keep in light and neutral. 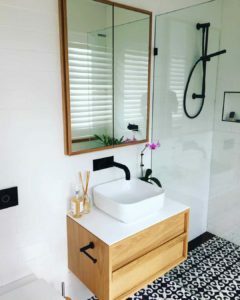 It did take a little bit of convincing to add the pops of colour that I wanted and the slightly more out there bathroom tiles; which he ended up loving in the end!. How long did you live in the house before you started renovating? We actually found the planning process for renovating our semi lots of fun. We were pretty lucky as we have a friend who is an architect. We had her design 3 different layouts and then we simply chose our favorite, and then started choosing finishes. My advice would be to have fun and trust your gut feeling – don’t over think things! How did you go with planning the budget? My husband and I are very laid back people, perhaps a little too much. To many peoples horror we actually didn’t sit down and do a budget before starting! We had a decent amount of money put aside and decided we would simply renovate the house room by room. Get each room right with the finishes that we wanted and then we would wait and save if needed before moving onto the next room. Before starting each room we would meet trades, get prices, choose fittings and fixtures and then start when we were ready to go. You used an Architect, how did you find their services? Did they make the process smoother? Yes, as mentioned we were lucky and used a young Architect that grew up in Inner West Sydney, Emmy, she was amazing – a friend of a friend. We explained our vision to Emmy and she did the design and plans as we discussed as well as 2 other options that she knew would work better. Of course we went with one of her options! How was the build period and trades management? What worked for you and what didn’t? The process was very slow due to the room by room approach we were taking. At times we couldn’t get the trades we wanted when we were ready and then would have to wait a few weeks for them. Also because my husband is a tradesman his business took priority so he would only work on our place on quieter weeks and because it was a lot of his friends that were working on our house they would sometimes push us back to work on their customers homes! What do you love about your reno? Bathroom tiles in both the main and ensuite – can’t choose a favorite! How did you source your fixtures / fittings? We sourced everything ourselves, looking in magazines and online. Our bathroom tiles were ordered online and got shipped down from Byron Bay! 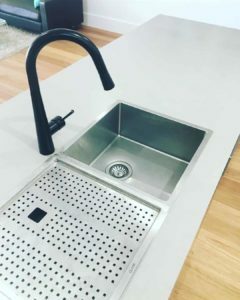 Kitchen tap was bought from Melbourne online and most other things from showrooms in Sydney. What does your husband and children love about the reno? My husband loves the overall feel of the home now and my daughter loves crawling up and down our long hallway! What was the hardest part of the reno for you? Living through a very slow renovation while pregnant and having no kitchen for 3 months!! Did you have a timeline? We knew our approach meant it would take longer but we also knew it would allow us to do it the way we wanted and not have to go with cheaper finishes. We aimed to get it done in one year but it ended up blowing out to about 18 months. Yes – well not me but my husband! He is a plumber so obviously did the plumbing but he also did a lot of the demolition and prep work. Not really! At the time I hated living through it but now I love our home so much! 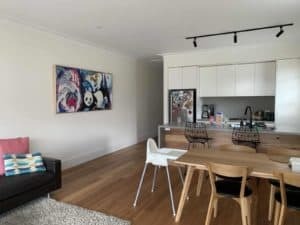 Thank you Caitlin for sharing your gorgeous inner west semi renovation with us. 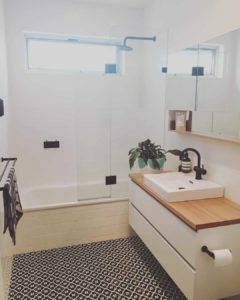 Love how you tackled your project room by room and made it work for you, and those tiles are beautiful! Do you have have great renovation experience you would love to share with us (or even a not so great Real Reno story?). We would love to hear from you! Drop us a line here and let us know all about it. 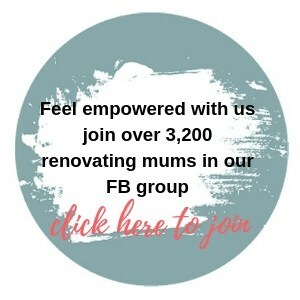 Don’t forget to also join our community Facebook group to chat with other local Sydney renovating mums.